This is oblivious, the LGBT community is politically active and I think if you look at any oppressed community you will also find them politically active. Social activism is an important tool for enacting social change, especially for stigmatized minorities and poor populations who often lack access to more traditional avenues for change — like elections, the courts, mainstream media, or school curriculums. In those cases, social movement tactics like boycotting, protesting, and civil disobedience prove critical in the fight to secure civil and human rights. 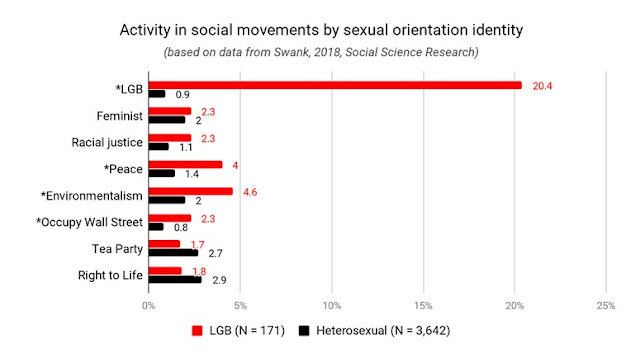 It wouldn’t come as a surprise that people are most likely to engage in activism for their own group: There are far fewer men than women at feminist rallies, for example, and far fewer heterosexuals than queer folks at pride marches. But is there some crossover between social movements? In other words, are people who belong to one stigmatized group more likely to be also active in social movements that primarily affect other stigmatized groups? A new study using a nationally representative sample of almost 4,000 US adults surveyed in 2012 suggests this might be the case. 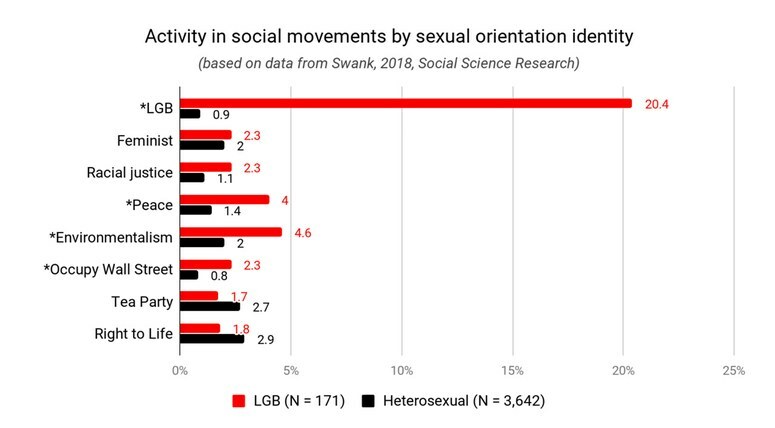 As the graph below shows, the 4.5% of respondents who considered themselves gay, lesbian, or bisexual (other sexual orientation labels were not offered on the survey, nor were trans identities or movements) were more likely than heterosexuals to have been active in several liberal social movements. Unsurprisingly, LGB folks were much (as in 20 times!) more likely to be involved in the LGB rights movement than straight folks. But they were also 2-4 times more likely to be active in the peace, environmentalism, and Occupy Wall Street movements. There was also slightly higher participation of queer folks in the feminist and racial justice movements, and slightly lower participation in the Tea Party and anti-abortion movements, but neither of these group differences reached statistical significance (noted with an * in front of the movement’s name on the graph). When you are discriminated against whether it is for sexual orientation, gender identity, race, religion, national origin or any other marginalized people you are going to fight for your rights. Is It A Battle Lost? What’s Going On In Britain? We Always Get Criticism When We Do It.